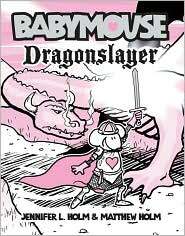 Babymouse: Dragonslayer by Jennifer L. Holm & Matthew Holm. Random House, 2009. Currently available. Face Value: Very charming. It makes me happy to see a well-illustrated cover with a girl character in a triumphant pose. It is also good to see that Babymouse in fantasy garb is not sexualized at all, which is something that happens to a lot of female characters on fantasy book covers – check out this guy’s blog post for some very interesting and mildly hilarious evidence of this phenomenon. Does it break the slate? Yes! The last time I reviewed a Babymouse book I wrote about how Babymouse was a character with Slatebreaking potential, but she had not quite reached full Slatebreaking status in the first book in the series. I am happy to report that Babymouse can officially be called a Slatebreaker. She slays the dragon not only in her imagination but also conquers her real-life fear, and that is a terrific moment. I have only read two Babymouse graphic novels, with this one being #11 in the series, and I think I can safely assume that the other books depict Babymouse doing many other wonderful and Slatebreaking things. Who would we give it to? This is the perfect book for a young elementary grade reader who is struggling in math class, or really any subject. Babymouse takes her struggles with a challenging subject and turns it into a victory. The Babymouse books do an excellent job conveying dramatic tension with minimal text, so it would also be a good fit for reluctant readers. Review: Babymouse is great at imagining things. She loves reading, and she places herself in the stories from her books, imagining fantastical adventure scenarios with herself in the leading role. Unfortunately, her active imagination does not seek to be helping her in math class. When her math teacher returns her homework with a big fat F- (what kind of teacher gives an F-? ), Babymouse is stunned. She knows that she is struggling in math, but she doesn’t know how to fix her problem. Babymouse’s math teacher offers to excuse the offending grade if Babymouse joins the school math team, also known as The Fighting Fractions. Babymouse is doubtful that she will be able to contribute anything to the team, but she goes anyway. She certainly doesn’t want to have that F- lingering in the grade book. It was nice to see a teacher offering Babymouse an option change her grade in a way that would further utilize her math skills. Sometimes teacher characters are portrayed as evil torturers who do not want their students to succeed. Clearly Babymouse’s teacher wanted her to succeed, but she wasn’t going to let Babymouse get away with avoiding a subject because she didn’t like it. Babymouse is surprised when she meets her fellow mathletes and the math team advisor. She was sure that they would be a group of sniveling nerds, but they’re actually pretty cool. Among her teammates are a former football player shark (he joined The Fighting Fractions after a nasty dorsal fin injury) and a girl bat that defies stereotypes and loves math. Babymouse is embarrassed that she cannot keep up with them when doing math drills. Rather than ridiculing her for her lack of skill, they support Babymouse and welcome the imaginative spirit that she brings to the team. The Fighting Fractions continue to prepare for the upcoming math olympics. Babymouse feels less and less confident in her mathematical abilities as the competition approaches. Despite her doubts, she shows up for the contest and helps her team as best she can. They go up against reigning champions and major bullies the Owlgorithms. After a nasty mishap that takes down a member of both teams, technicalities require one member from each team to go head to head on a word problem. Babymouse is terrified when her name is selected. Paralyzed with terror, Babymouse doesn’t know how to begin to solve this word problem. And she’s on the clock! The math team advisor, who knows Babymouse’s strengths, says, “Believe in yourself. Besides, it’s a word problem. You’re good at reading. Give it a whirl.” And that’s when it clicks. All Babymouse has to do is place the numbers within an imaginary story context, and she can easily solve the problem. She realizes that although math is not her greatest strength, she can use the strong skills she does have (such as imagining things) and use them to her advantage when faced with a challenge. One of the trademarks of the Babymouse series is that each book is punctuated with Babymouse’s escapist imaginative scenarios. She copes with her real life obstacles in imaginary settings and then tackles the problems in real life. Each one of these passages is vividly illustrated and packed with action as Babymouse takes the leading role. Well-read kids will enjoy the allusions to classic fantasy series such as Narnia and The Lord of the Rings. This book resonated with me because I was a kid who struggled with math. Who am I kidding – I still struggle with math. The quantitative section of the GRE was a nightmare for me. When I was in middle and high school, I knew that I was fulfilling a stereotype by being a girl who avoided math and I felt very guilty about it. I still do. But you know what? I am good at other things and my strengths lie in working with words and images. This Babymouse book is perfect for readers who have a lack of confidence in their mathematical skills. It shows that yes, you can be a girl and be great at math, but you can also be a girl who doesn’t like math. Neither is better or worse, as long as you do not act like you cannot do math because you are a girl. You just have to find a way to use your existing skills to get around it. And you should never back down from trying something just because you think you will be bad at it. It never hurts to try. Reviewed from a copy purchased at the Phoenix Book Company table at the ASU Language & Literacy Conference. This entry was posted in Graphic Novels, Middle Grade and tagged Babymouse, Graphic Novel, Jennifer L. Holm, math, Middle Grade, reluctant readers. Bookmark the permalink.